Austrian author; born May 5, 1816, at Jung-Bunzlau, Bohemia; died at Arco, Tyrol, Dec. 19, 1879. He was studying to become a rabbi when (1837) his unsteady disposition drove him to France to join the French foreign legion. After many adventures he returned home, and received, on account of a novel in the magazine "Libussa," a call to Budapest to edit the magazine "Der Ungar." 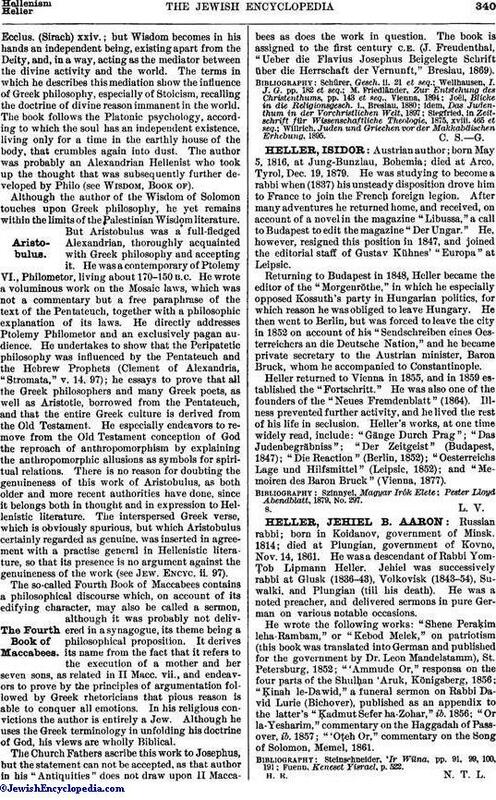 He, however, resigned this position in 1847, and joined the editorial staff of Gustav Kühnes' "Europa" at Leipsic. Returning to Budapest in 1848, Heller became the editor of the "Morgenröthe," in which he especially opposed Kossuth's party in Hungarian politics, for which reason he was obliged to leave Hungary. He then went to Berlin, but was forced to leave the city in 1852 on account of his "Sendschreiben eines Oesterreichers an die Deutsche Nation," and he became private secretary to the Austrian minister, Baron Bruck, whom he accompanied to Constantinople. Heller returned to Vienna in 1855, and in 1859 established the "Fortschritt." He was also one of the founders of the "Neues Fremdenblatt" (1864). Illness prevented further activity, and he lived the rest of his life in seclusion. Heller's works, at one time widely read, include: "Gänge Durch Prag"; "Das Judenbegräbniss"; "Der Zeitgeist" (Budapest, 1847); "Die Reaction" (Berlin, 1852); "Oesterreichs Lage und Hilfsmittel" (Leipsic, 1852); and "Memoiren des Baron Bruck" (Vienna, 1877). Pester Lloyd Abendblatt, 1879, No. 297.